Did you know that Principles for Life Ministries is a very strong supporter of missions? Most of you know that Cheryl and I had the privilege of serving for several years as missionaries in Romania. But now that we serve here at home, we are still just as passionate to see the gospel sent out and reach the ends of the earth. (Acts 1:8) Some are goers and some are senders. We are now senders. As senders, we began to take on the support of several missionaries last year both at home and abroad — 8 very effective and Christ-filled missionaries with the hope of helping to send out even more. In one of my next posts, I will give you a run-down of whom your prayers and gifts are helping to support. However, in this short post I want to spotlight and give thanks for the missionary work of my dear friend, Dr. Tom Pousche. Tom and I attended seminary together over 30 years ago now and are more excited today about serving the Lord than we were as young men. Tom is one of the greatest people-lovers, evangelists, and ministers of the gospel that I have ever known. Recently he has been called to serve the Lord in Africa. Just this November, he spent over a month in Kenya and Uganda with plans to return in February. Your prayers and financial support were strategic in making his trip possible, which means that the fruit he harvested is your fruit tool, for both the goers and the senders are partners in the harvest of God. May He richly bless you for it! 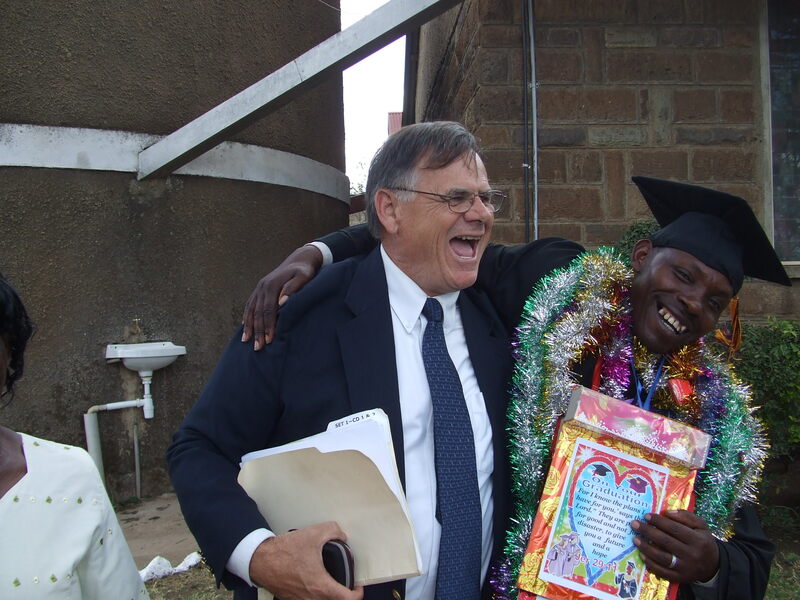 If you have an interest in providing further support for Dr. Tom, use the “Contact Us” at the top of the page, and we will make sure that 100% of your gifts go directly to his ministry in Africa. You can use the “Donate” on the left side of the page to make your gifts to him or any other supported missionaries. Below you will find a slide show depicting the work he did and the spiritual fruit God gave him. He says it is amazing how open the Africans are to the good news of Jesus Christ and how much he has grown to love them. Following the slide program, you can also watch a short video of Tom preaching in an African church. Enjoy it and may the gospel reach every corner of the earth through the faithful ministry of Dr. Pousche and all the other missionaries we support. To watch or download the slide show of Dr. Tom Pousche in Africa, click the play arrow > in the picture below. The songs used in the video are “Jump in the River” by Cleansing Stream Ministries and “Trucks” by Sandra Boynton. To watch Dr. Pousche preaching Jesus to the Africans (1 minutes long), click on the play arrow > in the picture below. I’ve often wondered what happened to Dr. Tom, now I see he’s been busy! I used to drive buses with him @ Tri-Met, and talk with him about the Lord! Thanks Joe! Hope you’ve contacted Tom. I am sure he’d love to hear from you. God bless! Just saw your name & felt compelled to say ‘Hi!’ Just returned from 2-wks of conferences where I facilitated (3-days in Burundi & 7- days in Rwanda). Check out my FB for some incredible pictures. I’m on my way to Zambia & Congo for 2-more conferences in April. I looking for more financial supporters . . . If God guides you my direction, I would be honored to have you as a partner. That’s good news. God bless!